This is a clip from the hour-long episode of Faces of Alaska, where host Kathleen McCoy is interviewing me about my family, and of course I have to tell stories. Hey, it’s what I do. 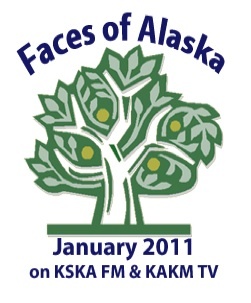 Here’s the Faces of Alaska page about me. The first week they talked to musher Lance Mackey, and this week they’ll talk to Alaska Native leader Willie Hensley. I’ve never had better bookends. And the week after Willie Faces of Alaska will feature Alaska Olympian Holly Brooks. You can watch us all on KAKM or listen to us on KSKA. Go to the website to see slideshows of the photos that ran during our shows and read Q&A’s. And email Pat Yack at pyack@alaskapublic.org to order a DVD copy of any or all of the shows.